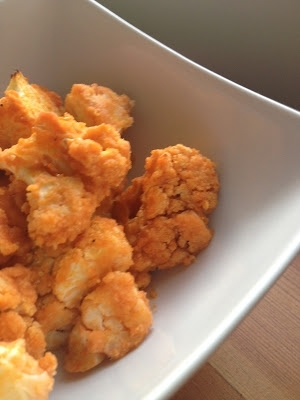 Transform boring cauliflower into a delicious, spicy side dish! 1. Preheat your oven to 400 degrees and line a baking sheet with tin foil and oil it up with some nonstick spray. 2. Chop up your cauliflower. Discard all the stems. You just want the pieces that have the pretty little florets on them. 3. Mix together the coconut flour, coconut milk, water, garlic and onion powders, and salt and pepper. 4. Dip your cauliflower in the batter and lay them out on the cookie sheet. 5. Once all your cauliflower pieces are coated, pop the baking sheet in the oven for 30-35 mins or until the cauliflower start to brown. 6. Mix together the buffalo sauce and melted butter. 7. When the cauliflower is done, toss it in the buffalo sauce. 8. Spread out the pieces on the cookie sheet once more and bake for another 5-10 mins or so.